An action adventure game in which we find ourselves on a planet controlled by aggressive robots. We control a character named Ara, who is accompanied by a young hawk. Together you travel through picturesque locations, trying to find a way to defeat the invaders. 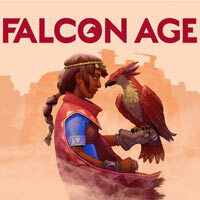 Falcon Age is an action adventure game developed by the Outerloop Games studio. The production utilizes VR goggles and motion controllers but does not require them in order to run. In Falcon Age, players find themselves on an alien planet that has been invaded by aggressive robots. The invaders destroyed the culture of the people who lived there and deprived the planet of its natural resources, turning it into a vast desert. During the events of the game we play as Ara, a girl thrown into prison for a minor offence. While waiting for the sentence, the heroine befriends a hawk, and when they both manage to escape, they set off on a long and dangerous journey. They must learn not only how to fight for their own survival but also how to support the resistance movement, which aims to throw the invaders out of their homeland once and for all. In Falcon Age, we observe the action from the first person perspective (FPP). The gameplay revolves around traversing various locations, talking to the characters living within them, and fighting enemies. In battles, Ara uses mainly melee weapons, with the support of her hawk, which, as time passes, becomes more and more effective at being a predator. Falcon Age has three-dimensional graphics that you can enjoy even despite their simplicity, thanks to the pleasing, cartoony design.